Whales sharks are by no means only found in Thailand – the Maldives’ tiny Hanifaru Bay, Sogod Bay in the Philippines and West Australia’s Ningaloo Reef are three other big whale shark havens – but for many divers, Thailand is where they see their first whale shark. It’s hard to express the sense of awe seeing one of these creatures for the first time – it’s like watching a spaceship come out of the blue, serenely gliding towards you with a squadron of cleaner fish flanking it on all sides. It’s only as it gets nearer, unphased by your presence, that you start to realise the speed it’s moving at and the sheer power within its immense body. Most whale sharks are around 4 to 6 metres – at minimum, twice the size of a human. It’s one of those moments when you realise that you are very much a privileged guest in another realm when you’re scuba diving. It should be stressed that while these are whale shark hotspots, it’s still rare to see them – they are spotted perhaps 10 times maximum in a six month season. So if you go diving expecting to see a whale shark, you’re probably going to be very disappointed. If you go diving with the idea that if you get very, very lucky one might turn up when you least expect it… it probably will. Because Hin Daeng and Richelieu Rock are in the Andaman Sea on the west coast of Thailand, dive boats only go there from November to April each year. The rest of the year – May to October – the seas are too rough to dive because of the monsoon season. The Similan marine park is also closed from 1 May to 31 October. The Gulf Of Thailand on the east coast of Thailand is diveable pretty much all year round – they get some pretty crappy weather from September to November but it’s very variable. Make your way the island Koh Lanta. From there you can get daytrips that go out to Hin Daeng. Koh Lanta is a little more effort to reach – you need to get a ferry over from Phuket or go via Krabi – but to my mind it’s are far, far better place to visit than Phuket. Much more scenic, less expensive, and not so crowded. You can go on liveaboards from Koh Lanta to Hin Daeng, and also liveaboards from Phuket visit Hin Daeng (although they tend to be more focussed on going to the Similan Islands). Besides the occasional whale shark, manta rays visit Hin Daeng very frequently. During the last dive season (2013 – 2014), my friends who work as dive guides on Koh Lanta and who have been visiting this site twice a week say that the mantas were there almost constantly, in contrast to previous seasons when they would disappear for a week and then return. Of course, no one can guarantee the mantas will be there, but you have very good odds of spotting them. The journey to the dive site is quite long – around three and half hours each way. It was on a dive from Koh Lanta in April 2005 that I saw a whale shark at Hin Daeng. Read the article I wrote for Asian Diver magazine about Hin Daeng. The only way to see Richelieu Rock is on a Similans liveaboard boat, like the one run by my friends at Phuket Diving Safaris. A liveaboard typically lasts four days and is ideal for doing a lot of diving without costing a fortune. You’ll need to get a liveaboard to the Similans either from Phuket, or from Khao Lak, which is about an hour up the coast from Phuket and geographically the nearest place on the mainland to the Similan Islands. 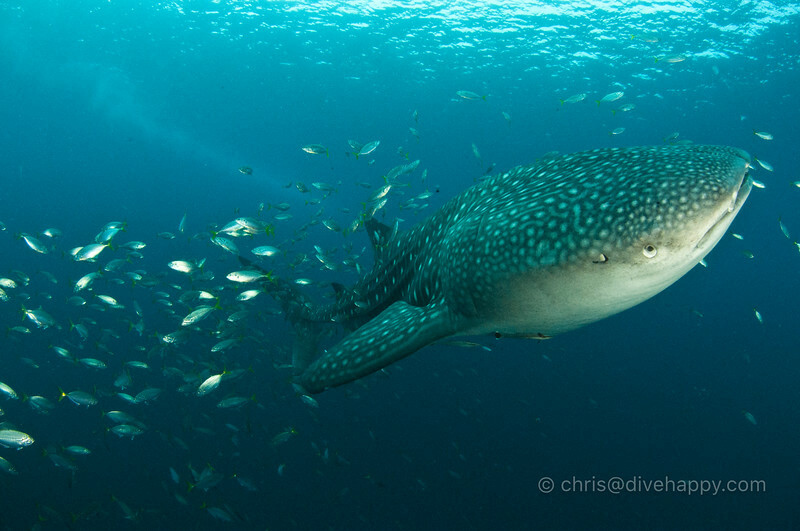 Richelieu is the most northern dive site on the Similan liveaboard itineraries, and it is an amazing dive site, whether or not you see whale sharks. It’s a horseshoe shaped rock in the middle of the ocean that acts a shelter and hunting ground for hundreds of different species of marine life. Read my complete trip report of a week long trip to the Similan Islands and Hin Daeng. Chumphon Pinnacle can be reached from Koh Tao in about half an hour or from Koh Samui in a couple of hours – a lot less if you’re on a speedboat. If you’re serious about diving, don’t bother staying on Samui – go straight to Koh Tao, because it’s much nearer the better dive sites. Koh Tao is also a lot more relaxed and less crowded than Samui, mainly thanks to its remoteness. It takes four hours to get to the island from the mainland at Surat Thani by ferry. Widely regarded as the best dive site in the Gulf of Thailand, Chumphon Pinnacle also sees whale sharks appear three or four times a year. Like the other sites mentioned here, it is a great dive site in its own right, particularly if you can find the grey reef sharks that patrol off the edge of Barracuda Rock. Good luck with your search for the whale sharks – and if you see them, let me know!